Here it is! Mitch Tulloch has updated his free ebook of last year; it™s now updated for Windows Server 2008 R2. 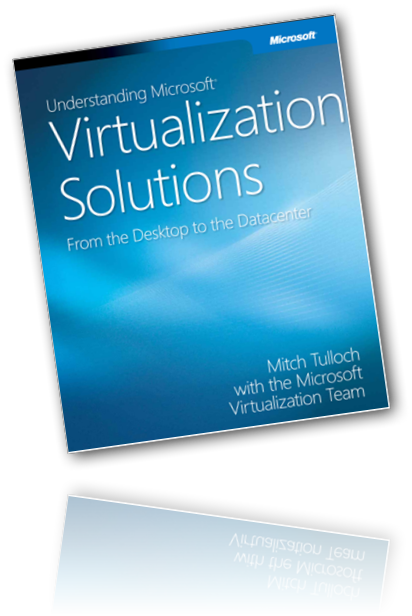 You can now download Understanding Microsoft Virtualization Solutions. Six chapters adding up to 466 pages. This Article Has Been Shared 2492 Times! Virtualization Software can be Free or Premium. We have listed some most used free and premium Virtualization Softwares. Virtualization with Hyper-V Server 2008 R2 needs some performance tuning for proper sizing of the swap file. We have focused on the settings for optimal result. Virtualization at Enterprise should involve substantial amount virtualization of servers. Author’s thoughts on the expansion that is driving the business moves. Application should dictate the best virtualization platform, not vice versa. The day when all applications were virtualized on a single hypervisor is over. Cite this article as: Abhishek Ghosh, "Understanding Microsoft Virtualization Solutions," in The Customize Windows, October 21, 2010, April 25, 2019, https://thecustomizewindows.com/2010/10/understanding-microsoft-virtualization-solutions/.